After World War II the old social hall at 233 Front Street found new life when Heaton Randall bought it and rented the bottom floor for movies. People had been going to movies at Walnut Creek’s El Rey Theater in the forties, so they loved having movies closer to home. Randall had experience running a movie theater and kept the place lively. There were Wednesday night special films featuring the Three Stooges and W. C. Fields, live music, games like “name that tune” and prizes for game winners. In 1964 forty four people were killed when a Pacific Air Line flight from Reno to San Francisco crashed in the Tassajara Valley east of Danville near Tassajara Road. A distraught passenger evidently shot both pilots. The crash was remembered by valley residents very clearly. Bill Ketsdever of the Valley Pioneer wrote "A Morning Of Horror" which reported on the grisly scene: "red streaks in the grass" and "bits and pieces of torsos...humans who less than two hours before were capable of breathing, talking, laughing." He admitted at the article's conclusion that, had he known what was there on the hillside, he would not have gone to the site. Mel Whalin's small funeral home on Front Street, the San Ramon Valley Chapel, was just south of the Village Theater and took charge of the remains. Refrigerator cars were placed in the parking lot between the Chapel and the Theater, all victims were identified and, after deciding against a mass cremation, caskets (paid for by Pacific Air) were delivered to relatives. Whalin worked 50 hours straight, assisted by Frank Scott and several other deputy coroners. He said "there was an unused wing on the south side of the theater building and I used it as an autopsy room for a couple of weeks." Nathaniel Blumenfeld bought the building in 1969, brought it up to code and reopened it as a movie theater. One room in the hall held old fraternal articles as well as a skeleton which pranksters would pull out and set up in different places in the theater. Other owners in the seventies were Charles Boening and Robert and Betty Love. Double features were still shown, including Woody Allen movies in the late seventies. By 1980 it became the sanctuary for the International Church of the Foursquare Gospel, the Zion Fellowship. A nursery for babies was set up downstairs. The church held Sunday School classes next door in today's Town Meeting Hall. Finally, in 1987, the Town decided to purchase the building and, after a short discussion about tearing it down for a parking lot, renovated it for public use. Volunteers rallied to paint and work on the theater. Donations were raised by the community which supplemented Town funds. The theater was brought up to code, patched up and painted and new chairs were purchased. 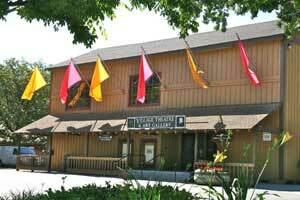 In 1989 the Village Theater Gallery, run by the Danville Area Cultural Alliance, opened in the second floor to wide acclaim. Changing art exhibits featuring local artists were mounted regularly until 2007. A local theatre group, the Role Players Ensemble, has partnered with the town to present plays there since 1991. Town recreation programs, films, music, dance, O'Neill plays and, since 2004, the Danville International Children's Film Festival have kept the building hopping. A room was added on the west to provide some backstage spaces and permanent theater seats were installed. In 2008 plans are in the offing for more renovations which will put Town staff upstairs, upgrade the bathrooms and enlarge the lobby area for art shows on the first floor. In 1988 Danville historian Irma Dotson said that "it's always been the center building of the town." Located midway between the library, community center and O'Neill Commemorative and the historic downtown and restaurants, the Village Theatre definitely contributes to Danville's valued sense of history. Sources: John Mustard, “101 years old, the theater is full of history and legends,” Tri-Valley News, Jan. 10, 1975; Jennifer Balboni,”Village Theater project regains life,” San Ramon Valley Times, Dec. 30, 1988; Joseph Harker Memories (2007),Valley Pioneers, Virgie V. Jones' Be It Ever so Humble, museum archives.